certainly would like to see that out of this team. I think that is the difference between good teams and great teams. Part of it lies with the culture created at the top and the other lies within the character of the players themselves. Do they care? GMs and coaches who are able to sus out these types of guys and plug them in are the ones who continually succeed IMO. At the pro level, talent is mostly a wash, which is why there is so much talk of parity. Obviously having that HOF QB can tip the scales greatly, bounces of the ball play a role too.....but in the trenches and overall it generally comes down to who wants it more. I'd much rather watch a team lose if they'v left it all on the field every down than one that finds a way to not win. Nunin wrote: certainly would like to see that out of this team. I think that is the difference between good teams and great teams. Part of it lies with the culture created at the top and the other lies within the character of the players themselves. Do they care? I guess that is what I am questioning.....is whether or not this team has enough fire. Some guys show it (Griffen, Diggs, Kendricks) but there are those that are on my fire wish list like Barr, Waynes, and the entire OL. I'm actually expecting a significant change on these terms along the o-line.....at least on the interior and specifically the run game. I can't imagine that there has been some cutting edge, new technique developed for lineman. It's all known and comes down to force of will, reaction and consistency. I like Berger anchoring the execution component with the younger guys around him learning. The tackles are a bit of a question....but nothing could be worse than last seasons edition and if the interior can create running room the pressure is greatly reduced. The offense will have some momentum and hopefully some self-respect. I expect positive development from this group by november as long as they can remain healthy. I take a different view of the O-line. I think part of it comes down to "who wants it more," but a much bigger part comes from technique and coaching. Every one of these guys is a monster. They're all 300+ pounds and strong as Babe the Blue Ox. Physically, the guys who win are the guys who are good at using their hands, creating leverage, executing good footwork, using momentum to their advantage, etc. Mentally, it's the guys who can see what's coming from the defense and react accordingly. Teamwork-wise, it's the groups of these mountain men who work the best together. Almost all of that stuff comes down to one word: COACHING. Sure, guys like Tyron Smith are incredibly gifted athletically. But there are so many instances of 5th-round O-linemen becoming All-Pros, and it's because they're coached extremely well. They also need to have the character to work their butts off to maximize their ability and hone their craft. Just because a guy has first-round talent doesn't guarantee he's going to be a great lineman. There are almost as many examples of first-round busts as there are 5th-round all-pros. Matt Kalil is a great example. I believe health was a part of the problem with Kalil, but again, that may have come down to coaching (strength & conditioning, poor technique). There are tons of other examples. We didn't have these problems when Mike Tice was O-line coach. Offensive line is one of the most coachable positions in football. Look at the University of Iowa. They get exactly ZERO 4- or 5-star recruits, yet they put at least one O-lineman in the pros every year, often in the first round. They take these big strong farm boys, coach 'em up, and turn them into NFL-ready players. When a team like the Vikings is consistently bad on the O-line year after year, no matter who they draft, that indicates a bigger problem to me than just who wants it more. They really do not need to hamper their season with a flat performance against a beatable Saints team on opening day. Especially considering they have a road game in PIT the following Sunday. IMO, this is more a challenge for Zimmer and his staff than a challenge for the players. Elimating flat performances was one of my keys to improvement for this season. Time to make it happen. J. Kapp 11 wrote: I take a different view of the O-line. I think part of it comes down to "who wants it more," but a much bigger part comes from technique and coaching. i agree totally with what you're saying and was fully on board with that mentality until i saw an nfl network piece about 4 lineman from different teams who gathered in the offseason to study and share technique. they said they didn't get enough coaching due to the collective bargaining agreement restraints. i don't recall exactly who the linemen were...but they were upper tier guys. and so what i mean by 'want to' goes as much into preparation and studious motivation as it does to the hand to hand stuff in the actual gametime fay. i do think the vikes have come up short in the coach em up department....but i also think it's equally imperative for the players themselves to take it upon themselves to know the trends and requirements of the guy they are across from each week. regardless of who is coaching, cause that's what pros do. when a guy isn't doing that or responding to coaching? get him outta there! agree with you about kalil and injuries. i also think, aside from soft coaching, that they have whiffed a bit in who they have chosen....talent/drive/work ethic/ brains etc. ultimately i believe a solid pro lineman will have more knowledge and know how about how to play his position than any coach in the league. i find it unimaginable that there was a coach on any sideline that could tell a hutchison or mckinnie how to go up against the guys they knew better than anyone. obviously someone helped coach them when they were younger...but a lot of that may have come from other veterans when they first came up. It's going to be a long season if we're already thinking this. I can't think of any reason why a game in week 1 would be considered must win. 5-0, 6-0, 6-2 doesn't mean much. I'd like to see this team to finish strong. I'm pointing towards coaching, will to win, and hunger. All I'm saying is if these are missing on Monday night, 1st game of the season, at home, against a good team (and AP) then maybe this team is not who I think they can be. I don't want to see a team "waiting" for something good to happen I want them to make it happen. When watching games I often look at the opponents sideline compared to ours. Quite often we look like a bunch of docile guys waiting for their turn and the other side showing some fire. True, but draft status does play a part and guys drafted early are drafted there for a reason. It doesn't help matters when most of your line is full of late-round/undrafted talent. Just look at us or Seattle as of late. Let's take the Cowboys line, arguably the league's best. I wouldn't say Iowa doesn't get any 4/5-star recruits. Below are a few I recall. My memory is iffy between Beluga and more recent years. Lots of O-line talent goes there for the reason that Iowa has a reputation for getting linemen drafted high. I'm not saying you're wrong, but there's a reason there's generally a higher "hit rate." The article below details this. Between 2005-2014, of 421 O-linemen drafted, 147 wound up as starters for at least half their careers. The first round had an 83% "hit rate" while the second round had a 70% hit rate. It does go on to say that the hit rate of lower rounds is a little higher relative to other positions. Bottom line: we need to draft/scout linemen better and draft them higher. The ones we let go don't really go on to have great careers elsewhere, indicating it may not be the coaching (though I agree it could probably be improved). Of course I say that and watch Kalil/Clemmings/Beaver become an All-Pros. I get what you're saying, DP. But while Dallas has expended a lot of draft capital on offensive linemen, it has come at the expense of their defense. Let's not forget, they've only won two playoff games THIS CENTURY. They also had the luxury of having the undrafted Tony Romo as their quarterback for the better part of a decade, allowing them to stockpile early-round talent at other positions. The Vikings, on the other hand, have used most of their recent draft capital on defense. Whether that strategy will ever pay off is up for debate, but it's the choice they've made. Any time I question our recent drafts, I only have to think back to the dark days of the Red McCombs era to put it in perspective. I swear, the Vikings missed on virtually every draft pick for the better part of 10 years (Adrian Peterson and Chad Greenway being a couple of notable exceptions). Even guys like Sidney Rice (one good season) and Percy Harvin (flake extraordinaire) didn't turn out the way we thought they would. I especially remember 2004 and 2005, when literally the only serviceable player taken was Mewelde Moore. At least the Wilfs are making an effort. J. Kapp 11 wrote: I get what you're saying, DP. But while Dallas has expended a lot of draft capital on offensive linemen, it has come at the expense of their defense. But have they? In the past 10 years they have selected 7 offensive linemen in the top four rounds. In the same time period the Vikings have selected 5 in the top four rounds. If you just compare top two rounds, those numbers are 3 and 2, respectively. They've committed a bit more to the offensive line and it's paid off. Though not necessarily in Super Bowls...so maybe not really. Comparatively, the Cowboys have spent 25 picks on defense in the first four rounds. The Vikings spent 20 picks on defense the first four rounds in the last 10 years. As stated above, the Vikings have spent fewer picks on defense than the Cowboys in the last decade. The difference is the Cowboys have lucked out and picked high-round guys that turned out (and stayed good/uninjured) on the offensive line. We seemed to have performed better at that on the defensive side of the ball (with fewer high/mid-round picks to boot!). Ugh. Those were rough days indeed. 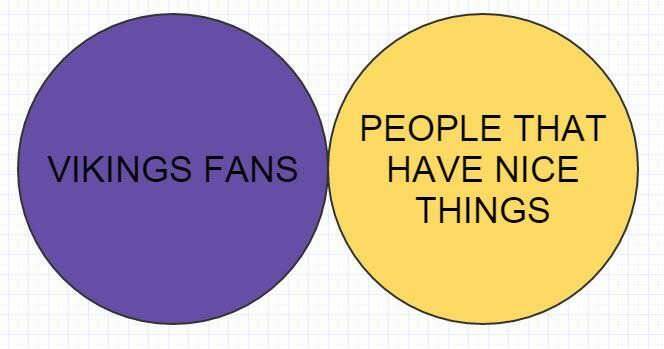 ...because us fans don't feel like tolerating an 0-1 start at this juncture of the Zimmer era. I will deal with it though...They'll be alright. Wow. There have been a lot of great posts here. I don't have much to add other than I am pumped and I do believe this game is very important for a lot of reasons. New Orleans may be a team we are battling for the wildcard with for one. I have always thought Soprano was a good coach and I do believe the talent level of this line is subpar but I'm hoping they can gel and be better than expected. Just don't ask Remmers to block the Von Miller's of the world for too long without help.